It's time to rethink your snack choices, CGs! They may be more convenient, but store-bought chips and junk food are usually fried in an unhealthy amount of oil and laden with salt and other artificial ingredients. As for the calorie content, let’s use this analogy: Two handfuls of Cheetos (42 pieces) has 306 calories, which is higher than the calorie content of a cup of white rice (242 calories). 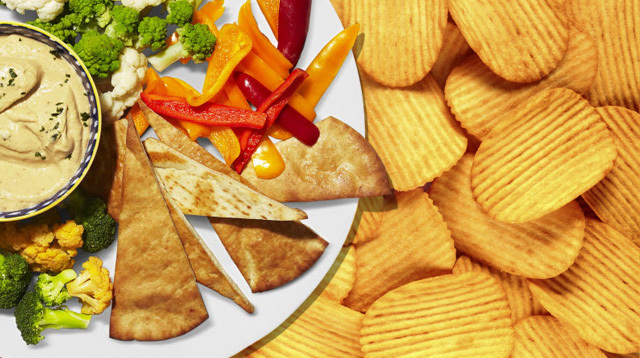 If you can’t resist a tasty, crunchy snack to get through the day, try to whip up a healthy version of chips at home. Here are three recipes that are easy to follow, with ingredients that suit most diets, including Paleo and vegetarian. 1. Preheat the oven to 250 degrees F (about 121 Celsius). 2. Scrub, rinse, and dry the sweet potatoes while the oven is warming up. 3. Using a vegetable peeler or a sharp knife, slice thin strips of potatoes. The thinner, the crispier. No need to peel off the skin if you washed the potato thoroughly. 4. Place 2 tablespoons of olive oil in a bowl and toss the sliced potatoes in the bowl to give them a light coating. You may add more olive oil if you wish, but note that a tablespoon has 134 calories. 5. Lay out the sliced potatoes in a single layer on a baking sheet lined with parchment paper and sprinkle with 1/4 teaspoon of salt. You may use iodized salt if you don’t have sea salt. 6. Bake for about 2 hours or until the chips are crisp and brown. Flip the chips at the halfway mark. 7. Remove the sheet from the oven and let the chips sit for about 10-15 minutes before munching. 1. Preheat the oven to 350 degrees F (about 177 Celsius). 2. Wash and peel the carrots while the oven is warming up. 3. Using a vegetable peeler or knife, slice the carrots diagonally and very thinly. Thick slices will not get crunchy. 4. Place 1/2 tablespoon of olive oil in a bowl and toss in the sliced carrots to give it a light coating. 5. Lay out the sliced carrots in a single layer on a baking sheet lined with parchment paper. Sprinkle with 1/4 teaspoon rock salt. 6. Bake for 20 minutes or until the sliced carrots are dry and crispy. Keep your eye on the carrots because they burn faster than potatoes. 7. After taking out the sheet from the oven, let the carrot chips sit for about 5-10 minutes before eating. 2. Wash and peel off the skin of the taro while the oven is warming up. 3. Using a vegetable peeler, carefully peel thin slices of taro. For parts that are difficult to peel, use a sharp knife to slice. 4. Lightly brush a baking sheet with olive oil and evenly place the taro slices on it. 5. Brush the tops of the chips with the remaining olive oil. 6. Bake for 15-20 minutes or until the chips are crisp. 7. Sprinkle with rock salt and let the chips sit for 5-10 minutes before eating.